Clara Bailon, a power-wheelchair user and transit safety advocate who uses buses, subways and Access-A-Ride vehicles. Clara Bailon is one of 900,000 New Yorkers with a disability who is bracing for Metropolitan Transportation Authority service cuts this June that promise to make an already challenging transit system more difficult to use. But even as the budget ax falls, disabled riders will continue to benefit from long-term technological and capital improvements that make the system more accessible. Bailon of the Bronx is a power-wheelchair user and transit safety advocate who takes buses, subways and Access-A-Ride vehicles to athletic activities, to see family and friends and, occasionally, to attend public hearings—where she tells the Metropolitan Transportation Authority (MTA) about accessibility challenges she experiences while traveling. 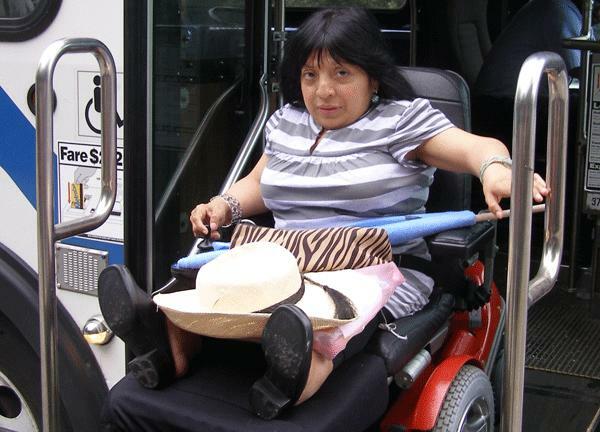 While traveling, Bailon worries about getting the back wheel of her power chair stuck in the gaps between train platforms and subway cars, being stranded on subway platforms when elevators break down and being pushed onto the tracks or dragged by doors that close before she has fully entered the train. “A lot of disabled riders don’t want to take the subway because, although it’s faster, it’s scary. In an emergency, how are you going to get out?” Bailon says. Some of Bailon’s worries are alleviated by the MTA’s designated boarding areas on subway platforms, which instruct people with disabilities to board near a conductor. However, when platforms are crowded, Bailon says she has difficulty getting there. “Wherever the elevator leaves me, that’s where I stay during rush hour, because it’s very crowded,” Bailon says. The MTA cuts will reduce weekend service frequency to accommodate construction on 11 subway lines, including the D train, which Bailon uses often. That will mean longer waits and larger passenger crowds. The changes also include the elimination of 33 bus routes and the restructuring of dozens more. The MTA has backtracked on plans to restructure the Bx15 that Bailon takes frequently to the nearest wheelchair-accessible subway station, the 149th Street-Grand Concourse stop on the 2, 4 and 5 trains. However, the MTA will use the Bx15 to absorb riders from the Bx55, which will lose late evening and weekend service. The cuts are designed to save $93 million per year, a fraction of the MTA’s $778 million budget shortfall. “Maybe you wonder why I go out, with all the trouble. Like I say, disabled people have things to do, people to see and places to go, and we want to have fun too,” Bailon says. The bus cuts are particularly troublesome to people with disabilities, many of whom rely on buses more often than subways. Transit riders with disabilities and the city’s 60,000 non-disabled seniors will also be hurt by cuts to the Access-A-Ride service, which provides shared-ride van and car trips to people who are unable to use buses and subways because of a disability. The MTA aims to reduce Access-A-Ride service by 783,000 trips per year. Most of the reductions will come through an initiative to replace 12 percent of door-to-door trips with a limited service that takes customers who are able to use buses and trains to the nearest accessible station rather than their destination. The MTA will also change the way it assesses the transit needs of customers whose disabilities make travel more difficult in hot or cold temperatures. Rather than designating customer eligibility based on season, the MTA will check the temperature to determine whether callers should receive the ride they request. Despite the service cuts, the MTA will continue to move forward with long-term technological innovations and capital improvements to increase transit accessibility, as demanded by the Americans with Disabilities Act and other legal requirements. The MTA says there are nine subway stations under construction to become accessible. Seven are scheduled for completion in the next two years with the installation of ADA elevators. The work falls under a legal mandate to make 100 centrally located stations accessible by 2020. The MTA is the process of installing Automatic Vehicle Locator Monitoring (AVLM) systems in all Access-A-Ride vehicles to increase trip efficiency and communication with drivers. According to Thomas Charles, vice president of the MTA’s Paratransit Division, the AVLM installation has been completed in 1,921 vehicles, or 85 percent of vans. Interactive Voice Recognition Systems will be installed next, allowing customers to receive notification when drivers are 15 minutes away. Under the current system, riders are asked to wait outside for up to 30 minutes for their vehicle with no notification of delays. Charles said the voice recognition system is near its final design review with the first phase to be implemented this fall and the second phase to be implemented in the spring of 2011. “At present, the timelines are not affected by the budget reductions,” he says about both improvements to Access-A-Ride. The MTA is also in the process of installing Braille-Tactile signs identifying track numbers in all subway stations where trains terminate. Those signs will assist people with visual impairments in locating the train that is leaving first. This work will occur within the next few months, according to a statement from the MTA’s Station Signage Unit. “We are in the process of surveying the stations, designing the signs, having them fabricated (which takes eight weeks),” said New York City Transit spokesperson Deirdre Parker. But achieving results that satisfy the disability community’s diverse needs continues to be a challenge. Kenneth Stewart, a subway rider with blindness, says the MTA should also use raised print on signs that customers can feel with their hands, since many people with blindness do not read Braille. Stewart has also called on the MTA to repaint portions of the recently renovated South Ferry station. The $527 million project that was completed one year ago added high-tech accessibility features but failed to provide visual contrast between the station columns and floor, all of which are white. This makes them difficult to distinguish for customers who are visually impaired but can see sharp colors like black and yellow stripes. Unlikely Key to NY&apos;s Mass Transit Hopes: The Automobile? A new toll proposal reflects transit truths: Many drivers have few transit options, many subway lines couldn&apos;t handle large numbers of drivers who gave up their cars, and toll revenue is critical. Yellow cab drivers and owners were outspoken on both sides of the debate over a plan to permit outer-borough street hails. What do the livery drivers who now prowl those streets think about it?